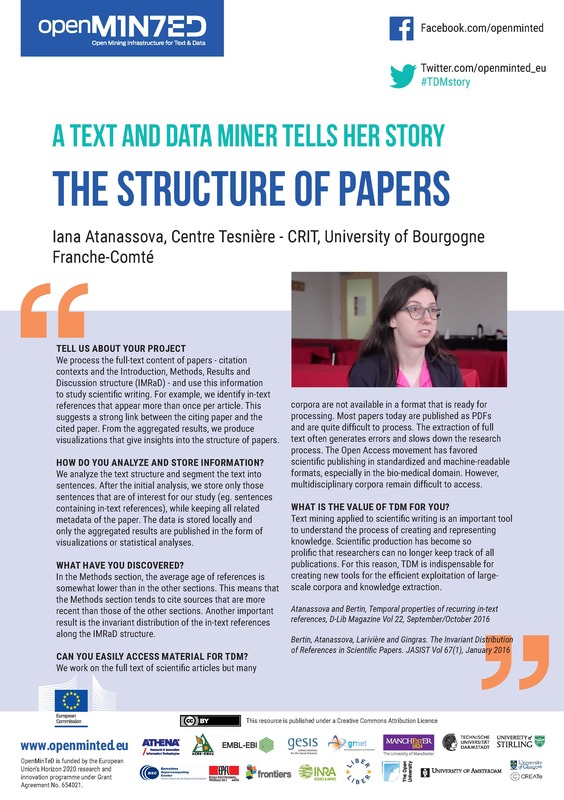 Iana Atanassova, Centre Tesnière – CRIT, University of Bourgogne Franche-Comté, is using Text and Data Mining (TDM) to study full-text scientific articles. Studying these papers can be a challenge, as they are usually in a format that is hard to process. 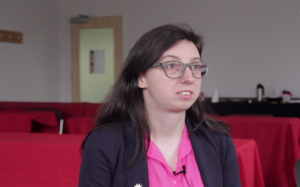 OpenMinTed first spoke to Iana in 2016 about her work. Recently we asked her for an update. Read the full interview below, or download a printable version to share with others. 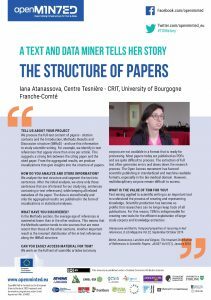 We process the full-text content of papers – citation contexts and the Introduction, Methods, Results and Discussion structure (IMRaD) – and use this information to study scientific writing. For example, we identify in-text references that appear more than once per article. This suggests a strong link between the citing paper and the cited paper. From the aggregated results, we produce visualizations that give insights into the structure of papers. HOW DO YOU ANALYZE AND STORE INFORMATION? We analyze the text structure and segment the text into sentences. After the initial analysis, we store only those sentences that are of interest for our study (eg. sentences containing in-text references), while keeping all related metadata of the paper. The data is stored locally and only the aggregated results are published in the form of visualizations or statistical analyses. In the Methods section, the average age of references is somewhat lower than in the other sections. This means that the Methods section tends to cite sources that are more recent than those of the other sections. Another important result is the invariant distribution of the in-text references along the IMRaD structure. CAN YOU EASILY ACCESS MATERIAL FOR TDM? We work on the full text of scientific articles but many corpora are not available in a format that is ready for processing. Most papers today are published as PDFs and are quite difficult to process. The extraction of full text often generates errors and slows down the research process. The Open Access movement has favored scientific publishing in standardized and machine-readable formats, especially in the bio-medical domain. However, multidisciplinary corpora remain difficult to access. WHAT IS THE VALUE OF TDM FOR YOU? Text mining applied to scientific writing is an important tool to understand the process of creating and representing knowledge. Scientific production has become so prolific that researchers can no longer keep track of all publications. For this reason, TDM is indispensable for creating new tools for the efficient exploitation of large-scale corpora and knowledge extraction.